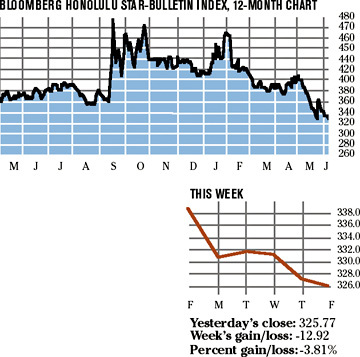 Central Pacific Financial Corp. topped the Bloomberg Honolulu Star-Bulletin stock index this week, gaining just more than 7 percent to close at $39.55. The parent company of Central Pacific Bank also tops the index year to date and for the last 12 months with gains of more than 10 percent and nearly 9 percent, respectively. 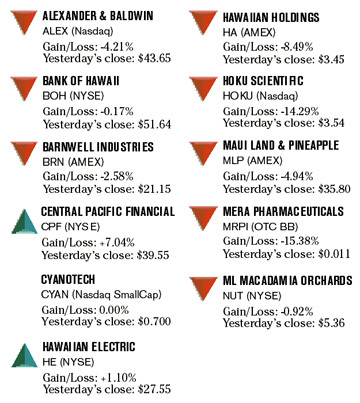 The only other stock in the index to stay above water for the week was Hawaiian Electric Industries Inc., up 1 percent to close at $27.55.